The Gold Line extension to Azusa is set to open on March 5, bringing light rail 11.5 miles deeper into the San Gabriel Valley. However, this is hardly the first time the San Gabriel Valley has seen passenger rail with a history going back decades. The above video isn’t decades old, but certainly serves as nice intro to this post! The Los Angeles and San Gabriel Valley Railroad was founded in 1883 with the goal of bringing rail to Pasadena from downtown Los Angeles. The line opened in 1885 and in the following years spread east across Foothill Cities. The train followed a route that is still mostly being used by the Gold Line today (the tracks between Pasadena and Arcadia were moved north to the 210 median when the freeway was built). The old Santa Anita Depot, now located at the Arboretum in Arcadia. Photo by Steve Hymon/Metro. In 1906, the line was sold to the Atchison, Topeka and Santa Fe Railway, whose Super Chief train between Chicago and L.A. ran from 1934 until 1971 when the Santa Fe Railroad stopped running passenger trains. Amtrak took over the route but eventually changed both the name (to Southwest Limited) and the route. Along the Gold Line, three of the old Santa Fe depots remain: in Pasadena (now La Grande Orange and the Luggage Room) and the stations waiting renovation in Monrovia and downtown Azusa. The old Santa Anita Depot was moved south years ago and can be seen along Baldwin Avenue in Arcadia at the Los Angeles County Arboretum. The freight rail corridor is still used — with freight trains still running east of the MillerCoors brewery in Irwindale. A big part of the Gold Line to Azusa projects involved moving the freight-only track to the south to accommodate the new two new light rail-only tracks. The western San Gabriel Valley was also heavily served by streetcars. They began running in the late 1800s, first with a horsecar line in Pasadena. 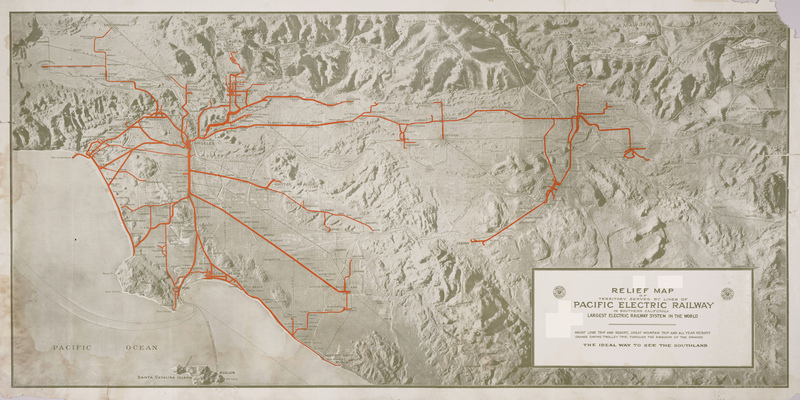 Streetcar service between downtown L.A. and Pasadena began in 1895 and Pacific Electric took over service in 1902. Huntington Boulevard was a major streetcar corridor — that’s why there’s a nice landscaped median today — with a pair of lines branching north to Pasadena and beyond. The streetcars also followed Huntington to the Foothill Cities, with the PE running through Arcadia, Monrovia, Duarte, Azusa and Glendora. The Duarte bike path along Royal Oaks Drive follows a trench that was used by the streetcars. Alan remains busy on two fronts: documenting with his camera (now digital) rail’s comeback in the area. Many of Alan’s photos can also be seen on the Metro Transportation Library & Archive’s Flickr page, in particular in the albums dedicated to Pacific Electric (here are three: PE Rail Lines, the PE subway, PE before and after — and there are more). A Super Chief train crosses the then-new bridge over the eastbound lanes of the new 210 freeway. Pacific Electric Arcadia Station at 1st and St. Joseph in 1951. Photo: Alan K. Weeks. The intersection of 1st and St. Joseph today. Less than 2 streets away is the new Gold Line Arcadia Station. Photo: Alan K. Weeks. A horse drawn streetcar in Pasadena in the 1880s. Santa Fe depot in Monrovia. Photo: Ron Reiring via Flickr. Pacific Electric Monrovia Station at Olive and Myrtle Avenue. The new Gold Line Monrovia Station is located approximately 1 mile south at Myrtle and Duarte. Photo: Alan K. Weeks. Aerial view of the Pasadena train station prior to the Gold Line station at Del Mar and Raymond being built. The Super Chief crosses Colorado Boulevard in Pasadena in 1958. Photo by Photo by Peter Higginbottom. Olive Avenue and Mayflower in Monrovia in Sept. 1951. Photographer: Alan K Weeks. As for the Super Chief, Amtrak served Pasadena with trains such as the Southwest Chief, Las Vegas Limited, and Desert Wind. In 1994, Amtrak passenger service was discontinued to Pasadena. The Gold Line opened to Pasadena in July, 2003. 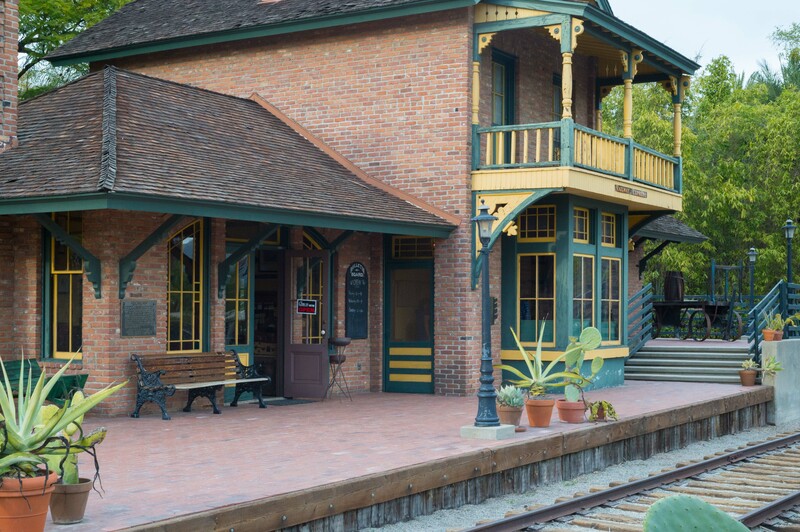 What was listed in your story as the “Sierra Madre” rail station is in fact the “Baldwin” station. Sierra Madre did have a rail station but it was well north and on the Pacific Electric Railway, not the Santa Fe. Good catch! I’ve edited it as Santa Anita depot, as that is what the Arboretum has it listed as. Not good enough catch as it IS the Santa Anita Santa Fe Station, not “Baldwin SDtation” It was on the Baldwin Estate–Sorry! What an amazing video, I remember in the early 90’s, the 3751 did several trips in the LA Basin, including running on this particular line. I’m amazed that back then there was no carpool lane on the 210, there really was a “true” emergency breakdown lane. Memories! When Amtrak took over operation of the Super Chief, Santa Fe was not happy with the new level or quality of service on the train. So they forced Amtrak to call it the Southwest Chief. I don’t know if there was ever any “Southwest Limited” train, but there is a Sunset Limited that runs on the former Southern Pacific (now UIP) tracks via DT Pomona and Ontario to Pal Springs and eventually New Orleans.